Dirk Wales not only creates masterpieces, he is a masterpiece. Living in Los Angeles when Hollywood was in it’s golden era, he studied filmaking and used his knowledge to create. But, he didn’t just create films; he has created art, written books, and is a prolific photographer, using many in his books. Beginning in 1992, Dirk has had the good fortune to have his work in galleries in Santa Fe, Chicago, New York, and China. Some highlights of his work are The Number Series, The Heaven and Hell Boxes, a second prize for his all-glass bird house, and photography in The Marble Series where the objects appear to be flowing in space- done without digital assistance. Other children’s and young adult books include: Jack London’s Dog, Twice a Hero: The Stories Of Thaddeus Kosciuszko And Casimir Pulaski: Polish American Heroes of the American Revolution, Penny House, and The Happiness Road Trip: The Search for Wellness. The art of Dirk Wales takes many forms of mixed media. “A show may be a combination of years of creative stimulation…first by photography and then by adding things, it becomes mixed media. My artistic hero is Joseph Cornell, who was the American surrealist who created ‘box art’ that is, collage and assemblage in a box. I love this, and it has become my path,” says Wales. Using his background in film making, Dirk Wales has been a screenwriter for much of his working career and has written more than 200 documentary, travel, children’s and other films and video. He lives and works in Chicago and Santa Fe, New Mexico. It’s all about letting your creative mind go and think, both inside and outside the Box. He recently stayed at the hotel I work at. He is the most vitriolic, hateful, angry person I have ever met. He repeatedly insults innocent people (after asking for their help) and believes everyone is trying to offend him at every turn. Ugh, just thinking about him gives me anxiety. Donna, he is a fascinating person all around. 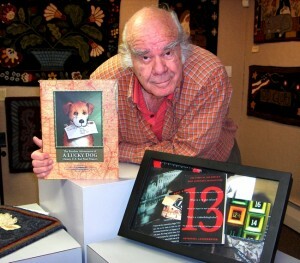 His life stories are just as good as his books and works of art. Someone should do his biography! Wow! A man of such diverse talents… Screenwriting, children’s books, art… This man will never be ready for the skilled care nursing facility – no way! Let’s not let him get away!